Changes in retinal microvasculature may reflect insulin resistance. We examined the association of changes in retinal microvasculature during pregnancy and risk of subsequent abnormal glucose metabolism in a cohort of mothers at baseline and 5 years postpartum. Of the participants from the Singapore birth cohort (Growing Up in Singapore Towards Healthy Outcomes [GUSTO]), 276 mothers attended both baseline (at 26–28 weeks of gestation) and follow-up (5 year postpartum) visits. At baseline we performed retinal photography and assessed retinal microvascular variables using a validated grading system. At follow-up, we assessed glucose tolerance using a 75 g OGTT. We defined abnormal glucose metabolism if participants: (1) had onset of gestational diabetes mellitus (GDM) in subsequent pregnancies within a 5 year follow-up period (n = 103) or (2) had prediabetes (impaired fasting glucose, impaired glucose tolerance or HbA1c 5.7–6.4% [39–46 mmol/mol]) and diabetes diagnosed at the 5 year follow-up visit (n = 84), according to WHO guidelines. The incidence of GDM in subsequent pregnancy and abnormal glucose metabolism 5 years postpartum was 25.2% and 30.4%, respectively. Each 10 μm widening in retinal venular calibre was associated with a significant risk of postpartum abnormal glucose metabolism (RR 1.2 [95% CI 1.0, 1.5]), independent of maternal age, college education, ethnicity, pre-pregnancy BMI and GDM at baseline. Narrower retinal arteriolar calibre and venular branching angle at baseline was associated with a higher insulin resistance index (1.4 [95% CI 1.1, 1.7] and 1.3 [95% CI 1.1, 1.6], respectively) at follow-up. Retinal microvasculature in pregnant women was associated with abnormal glucose metabolism 5 years postpartum. Alteration of microvascular structure during pregnancy may signal subclinical changes that underlie the development of prediabetes and diabetes. Jie Jin Wang and Tien Yin Wong contributed equally to this study. Pregnancy is a diabetogenic state characterised by potential hyperinsulinaemia and insulin resistance , resulting from the maternal effort to provide adequate nutrition to the fetus in utero . As pregnancy progresses, the increased level of hormones (e.g. cortisol and progesterone) reduces the phosphorylation of insulin receptor substrate-1, leading to insulin resistance . 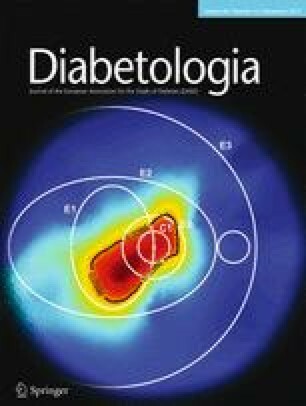 The increased incidence of abnormal glucose metabolism during pregnancy (gestational diabetes mellitus [GDM]) and after pregnancy (prediabetes [impaired fasting glucose, impaired glucose tolerance or HbA1c 5.7–6.4% (39–46 mmol/mol)] and type 2 diabetes), resulting from increased insulin resistance, has become a major health concern [4, 5, 6, 7]. Common risk factors for hyperglycaemia during or after pregnancy include older age at conception (e.g. ≥35 years), maternal obesity, race (e.g. Asian) and a family history of diabetes [4, 5]. It has been hypothesised that part of the pathophysiological alterations during the course of GDM and postpartum diabetes is microvascular dysfunction, and a reduction in both microvascular function [8, 9] and perfusion  has been documented among the general population with abnormal glucose metabolism. However, assessment of the microvasculature during pregnancy to establish this relationship among pregnant women is lacking and somewhat difficult. Retinal imaging provides a direct view of the retinal microvasculature that could be a proxy for the systemic microvascular structure [11, 12]. Alterations in retinal vessel calibre (e.g. retinal venular widening) have been found to be associated with insulin resistance, endothelial dysfunction and systemic inflammation [13, 14, 15, 16, 17]. A recent meta-analysis of data from five population-based, non-diabetic cohorts (n = 18,771) documented a significant association between retinal venular widening and the median 10 year incidence of type 2 diabetes . Therefore, it is postulated that abnormalities of the microvasculature signal subclinical pathophysiological changes prior to overt insulin resistance and hyperglycaemia. In a cohort of Asian pregnant women, we are the first to study the associations of retinal microvascular variables at 26–28 weeks’ gestation, measured from retinal photographs, with risk of GDM during subsequent pregnancies and the incidence of postpartum abnormal glucose metabolism (prediabetes and type 2 diabetes) within a 5 year follow-up period. We hypothesised that, independent of maternal age, college education, ethnic variation, maternal BMI and baseline GDM status, women with altered retinal microvascular variables (e.g. narrowing in retinal arterioles, widening in retinal venules) could be at increased risk of developing abnormal glucose metabolism in subsequent pregnancies or later in life. This was a prospective cohort study of mothers with and without GDM nested in an ongoing birth cohort in Singapore (Growing Up in Singapore Towards Healthy Outcomes [GUSTO]). A total of 1136 women with singleton pregnancies were recruited during their first trimester in the GUSTO birth cohort from June 2009 to September 2010. We have reported the study design and recruitment criteria in previous publications [19, 20, 21]. Inclusion criteria for pregnant women were: (1) Singaporean residents aged 18 years and above; (2) attending either KK Women’s and Children’s Hospital (KKH) or National University Hospital (NUH) and (3) intending to give birth and reside in Singapore for the next 5 years. As part of a substudy investigating 5 year maternal cardiometabolic outcomes, we recruited 200 mothers diagnosed with GDM at baseline visit (26–28 weeks’ gestation) according to 1999 WHO guidelines , and 200 mothers without GDM who were matched with the GDM mothers for age, ethnicity and BMI. The following inclusion criteria were used: (1) mothers who attended both the baseline and 5 year follow-up visits; (2) mothers who did not have chronic hypertension and/or diabetes at baseline and (3) mothers who were not pregnant at the follow-up visit. Of the 400 mothers targeted, 369 attended the 5 year follow-up visit and 354 met the inclusion criteria. After excluding 47 mothers who declined participation and 31 who withdrew after consenting, a total of 276 women (response rate 78.0%) were included in this study (Fig. 1). Of these 276 mothers, 142 were diagnosed with GDM at 26–28 weeks’ gestation while 134 were not. Of the 142 mothers with GDM at baseline, 29 did not require treatment, 103 were placed on diet control and ten were placed on insulin treatment. We conducted the study according to the tenets of the Declaration of Helsinki and obtained approval by the SingHealth Centralized Institutional Review Board and the National Health Group’s Domain Specific Review Board. We obtained written informed consent from all participants for our study at the 5 year follow-up visit. We performed digital retinal photography on both eyes without pupil dilation, using a 45° non-mydriatic retinal camera (Canon CR-1, 40D SLR digital retinal camera backing; Canon, Tokyo, Japan). A trained grader assessed the best-quality retinal image centred on the optic disc of each eye, using a semi-automated computer-based programme (Singapore I Vessel Assessment [SIVA], version 3.0; Singapore Eye Research Institute, Singapore) following a standard protocol [19, 20, 23]. We masked trained graders to the identification of participants and GDM status. Graders assessed retinal microvascular variables quantitatively within a zone 0.5–2.0 disc diameters from the optic disc margin. The variables included retinal vascular calibre (width of erythrocyte column within retinal arterioles or venules) and retinal vascular branching angle (first angle subtended between two daughter arterioles or venules at each bifurcation). We assessed intra-grader reliability using 10% (n = 27) of randomly selected retinal images from the GUSTO study, and the intra-class correlation coefficient was above 0.80 for all retinal vascular variables [19, 20, 21, 24]. GDM in subsequent pregnancies within the 5 year follow-up duration was self-reported. Trained staff administered a face-to-face comprehensive questionnaire that covered detailed pregnancy and birth outcomes. Mothers recalled each live birth with its associated pregnancy complications (e.g. pre-eclampsia, gestational hypertension, anaemia and antenatal depression) in a chronological sequence. At the 5 year follow-up visit, we conducted a 75 g OGTT after participants had fasted overnight for 8–10 h. We sent our plasma samples to the Singapore General Hospital laboratory and examined a panel of blood tests, including fasting glucose level, fasting HbA1c level, fasting plasma insulin level and a 2 h glucose level. We defined prediabetes as the presence of any of the following conditions: (1) impaired fasting glucose (fasting plasma glucose 6.1–6.9 mmol/l) ; (2) impaired glucose tolerance (fasting plasma glucose <7.0 mmol/l and 2 h plasma glucose 7.9–11.0 mmol/l)  and (3) HbA1c 5.7–6.4% (39–46 mmol/mol) . We defined type 2 diabetes as fasting plasma glucose ≥7.0 mmol/l or 2 h plasma glucose ≥11.0 mmol/l . We further grouped both incident prediabetes and type 2 diabetes at the 5 year visit as postpartum abnormal glucose metabolism. The calculation of HOMA-IR was applied according to a standard equation used in prior publication . We performed a 75 g glucose OGTT at baseline visit (26–28 weeks’ gestation) for all participants. We defined GDM as fasting glucose ≥7.0 mmol/l and/or 2 h glucose ≥7.8 mmol/l, according to 1999 WHO guidelines . We also measured BP using an automatic Omron sphygmomanometer (Omron HEM 705 LP; Omron Healthcare, Lake Forest, IL, USA), standing height using the SECA model 213 (Seca, Hamburg, Germany) and standing weight using the SECA model 803, according to standardised protocols . BMI was measured as (weight in kg) / (height in m)2. Trained staff administered questionnaires in either English, Chinese, Malay or Tamil. We collected information on the highest education level, household income, family history of diabetes, past pregnancy history (parity, past gestational hypertensive disorder and past GDM), pre-pregnancy weight and in vitro fertilisation (IVF) at baseline visit (26–28 weeks’ gestation). We calculated the mean and SD or median and inter-quartile range (IQR) based on the distribution of continuous variables. We presented baseline characteristics by maternal outcomes within a 5 year follow-up period for the following groups: (1) mothers with and without self-reported GDM in subsequent pregnancies after baseline visit and (2) mothers with and without development of abnormal glucose metabolism at the 5 year follow-up visit. We log10-transformed fasting plasma insulin and HOMA-IR variables due to their skewed distributions and reported the estimates of variables after a back-transformation. We applied multiple linear regression models to examine the associations between microvascular variables measured at baseline and glucose biomarkers measured at the 5 year follow-up. We further applied Cox-proportional hazards models to examine the associations between baseline gestational microvascular variables and the risk of self-reported GDM in subsequent pregnancies among mothers who had another pregnancy since baseline, and the risk of abnormal glucose metabolism at 5 year follow-up among all mothers included in the study. The self-reported information did not include inter-pregnancy interval and exact gestational age when subsequent GDM was diagnosed. We therefore used a median follow-up time as the time-to-event for self-reported GDM in subsequent pregnancies. We applied the following four models for both linear regression and Cox-proportionate hazard regression analyses: model 1, unadjusted; model 2, adjusted for maternal age, ethnicity and college education at baseline visit; model 3, as for model 2 and additionally adjusted for baseline pre-pregnancy BMI and model 4, as for model 3 and additionally adjusted for baseline GDM status. To test the robustness of study findings, we performed sensitivity analyses by including the following variables in model 4: family history of diabetes, IVF, parity, smoking history, weight gain at 26–28 weeks’ gestation and self-reported history of GDM prior to baseline. We assessed potential effect modification by GDM status at baseline visit in relation to the two study outcomes, using multiplicative interaction terms of GDM with retinal microvascular variables. Statistical analyses were conducted using Stata (version 14.0; Stata, College Station, TX, USA). We provided 95% CIs for all estimates and set a significant p value at 0.05. Of 276 mothers, 103 had subsequent pregnancies during the 5 year period and 26 of these were complicated by GDM (median 2 years, IQR 2 years), with an incidence of 25.2%. The 5 year incidence of postpartum abnormal glucose metabolism was 30.4% (84/276). Table 1 shows the baseline characteristics of the mothers. Compared with their respective counterparts, a lower proportion of the mothers who had neither GDM in subsequent pregnancies nor 5 year abnormal glucose metabolism reported a family history of diabetes or a history of past GDM prior to baseline visit. Furthermore, mothers who did not develop 5 year abnormal glucose metabolism had lower pre-pregnancy BMI (23.1 vs 25.7 kg/m2), lower mean retinal microvascular calibre (e.g. retinal venular calibre 167.8 vs 171.5 μm) and lower mean blood pressure (e.g. SBP 109.6 vs 111.6 mmHg) at baseline, compared with mothers who developed 5 year incident abnormal glucose metabolism. After adjusting for maternal age, college education, ethnicity, pre-pregnancy BMI and GDM status at baseline, the retinal arteriolar narrowing and retinal venular branching angle narrowing at 26–28 weeks’ gestation were consistently associated with increased levels of plasma fasting insulin at 5 years (Table 2). Each 10 μm narrowing in retinal arteriolar calibre was associated with an increase in mean insulin level of 9.7 pmol/l (95% CI 7.6, 11.8) at 5 years. Similarly, each 10° decrease in retinal venular branching angle was associated with an increase in mean insulin level of 9.0 pmol/l (95% CI 7.6, 11.8) (Table 2). Narrowing of retinal arterioles and venular branching angle was positively associated with HOMA-IR (1.4 [95% CI 1.1, 1.7] and 1.3 [95% CI 1.1, 1.6], respectively) (Table 2). There was no association of any retinal parameter with 5-year HbA1c (data not shown). After adjusting for maternal age, college education, ethnicity, pre-pregnancy BMI and GDM status at baseline, each 10 μm widening in baseline retinal venular calibre was associated with a significant increased risk (RR 1.2 [95% CI 1.0, 1.5]) of incident abnormal glucose metabolism in 5 years, and a non-significant increased risk (RR 1.2 [95% CI 0.8, 1.8]) of GDM in subsequent pregnancies (Table 3). Additional adjustment for maternal characteristics (e.g. family history of diabetes, IVF, parity, smoking history, self-reported history of GDM prior to baseline and weight gained at 26–28 week gestation) did not appreciably change the associations observed. We found no evidence of effect modification by 26–28 weeks’ gestation GDM status or maternal ethnicity (p value in all interactions >0.05) on the reported associations. In this cohort of mothers with and without GDM (1:1 ratio) at baseline, we found that one in four experienced GDM in subsequent pregnancies and nearly one in three developed abnormal glucose metabolism 5 years postpartum. Narrowing in retinal arteriolar calibre and retinal venular branching angle at 26–28 weeks’ gestation was associated with elevated plasma insulin level and insulin resistance at 5 years. Widening retinal venular calibre at 26–28 weeks’ gestation had a significant association with 5 year incidence of abnormal glucose metabolism and a non-significant association with GDM in subsequent pregnancies, independent of maternal age, college education, ethnicity, pre-pregnancy BMI and baseline GDM status. Significant changes in maternal metabolism during early pregnancy may occur, including increased maternal adipose tissue, glycaemia, insulinaemia and elevated postprandial fatty acid levels . These alterations are induced partly by hormones and mediators secreted from the placenta and could lead to peripheral insulin resistance [3, 28]. When inadequate insulin secretion is unable to counterbalance the insulin-resistant state in the later phase of pregnancy, maternal glucose intolerance and hyperglycaemia (e.g. GDM) may follow. However, such changes are too subtle to detect in early pregnancy using current conventional clinical assessments. In the past two decades, advanced retinal imaging technology has made it possible to directly and quantitatively assess retinal small vessel structure in a non-invasive manner . Previous studies have shown that altered retinal microvascular morphology, including retinal arteriolar narrowing, retinal venular widening and reduced retinal arteriolar fractal dimension, is associated with GDM , prediabetes and diabetes [15, 16, 30, 31]. Microvascular changes have been postulated to be part of the pathophysiological changes occurring in the diabetogenic process [15, 16, 29, 30, 31]. A recent meta-analysis of data from five population-based cohorts showed a significant association of retinal venular widening at baseline with the 10 year incidence of diabetes: pooled HR 1.09 (95% CI 1.02, 1.15) per SD (20 μm) increase in retinal venular calibre, after adjusting for demographic, lifestyle and clinical factors . These findings suggested that microvascular dysfunction, indicated by retinal microvascular changes, occurs during the course of insulin resistance, impairing glucose delivery and glucose uptake [10, 32]. Recent studies have explained that microvascular dysfunction would result in failure of nutrient and oxygen supply optimisation within the tissue in response to an increase in demand . Dysfunctional microvasculature fails to maintain a relatively steady hydrostatic pressure at the capillary level, leading to disturbances in capillary exchange . The altered blood pressure and blood flow patterns in small vessels may result in changes in peripheral vascular resistance and insulin-mediated changes in muscle perfusion and glucose metabolism . Our previous findings showed that retinal microvascular morphology mirrored cross-sectional changes in vascular resistance  and abnormal glucose metabolism during pregnancy . Thus, we postulated that altered retinal microvasculature might imply an underlying microvascular dysfunction contributing to the diabetogenic process. Our results in pregnant women are not only in keeping with previous findings in the general population  but also support the following speculations that may have implications in future research: (1) retinal venular widening is suggested to reflect degrees of endothelial dysfunction and inflammation ; (2) retinal arteriolar narrowing and retinal venular branching angle narrowing is suggested to be associated with increased levels of nitric oxide  and oxidative stress [35, 36] and (3) conditions such as endothelial dysfunction and systemic inflammation may lead to impaired microvascular perfusion  and further insulin resistance [10, 37] via diminished glucose uptake in skeletal muscle and accumulation of peripheral glucose levels [10, 38]. Our findings may also help to provide a potential novel and quantitative predictor (e.g. retinal venular calibre) during pregnancy for identifying mothers who are at high risk of abnormal glucose metabolism after pregnancy or in subsequent pregnancies. However, since we did not assess HOMA-IR at baseline, we were unable to compare the performance of retinal vasculature assessment with HOMA-IR plus OGTT in women at risk of postpartum abnormal glucose metabolism. Future studies on large samples of pregnant women with a longer follow-up period are warranted. The strength of our study lies in its prospective study design with a relatively long follow-up and a reasonable response rate (78%). Detailed information on pregnancy and birth outcomes were collected and novel retinal microvascular assessments were performed during pregnancy, following standardised protocols. There are limitations that one should bear in mind when interpreting our findings. First, baseline GDM diagnosis was defined by WHO 1999 guidelines, which only require fasting and 2 h glucose testing after a 75 g oral glucose intake. It has been suggested that the International Association of the Diabetes and Pregnancy Study Groups (IADSPG) criteria may be more sensitive for identifying mild glucose intolerance during pregnancy and that GDM cases may be misclassified using WHO criteria. According to a WHO 2013 report, both WHO 1999 and IADSPG criteria identify women at higher risk of developing adverse pregnancy outcomes including pre-eclampsia, macrosomia, prenatal mortality and Caesarean section . However, a higher quality of evidence was observed for the WHO criteria and studies evaluating the IADSPG showed inconsistent results . Furthermore, the IADPSG criteria identified a larger number of true positives yet a milder degree of hyperglycaemia, of which a larger proportion would not develop an adverse outcome . As it was not our objective to compare the performance of 1999 and 2013 WHO guidelines for the diagnosis of GDM, and our outcome of interest was maternal postpartum abnormal glucose metabolism, the impact of such misclassification on the association studied might not be significant. Second, incident GDM in the subsequent pregnancies was self-reported. Recall bias might be applicable. Third, there were missing data in pre-pregnancy weight recall (n = 10), leading to fewer numbers included in the final adjusted model. Last, but not least, our samples were purposely selected with a 1:1 ratio of mothers with and without GDM at baseline and therefore the estimated magnitudes of incidence rates and risks are not directly generalisable to the whole population of pregnant women in whom the prevalence of GDM is less than 50%. Nevertheless, the associations observed generate an interesting hypothesis that may be applicable to future research and clinical management. In conclusion, we found that in this cohort of mothers with and without GDM at baseline, altered retinal microvascular morphology (e.g. retinal arteriolar narrowing and retinal venular branching angle narrowing) was associated with postpartum insulin resistance represented by fasting insulin level and insulin resistance index. Furthermore, mothers showing retinal venular widening were at increased risk of abnormal glucose metabolism at 5 years postpartum, independent of maternal pre-pregnancy BMI and GDM status at baseline pregnancy visit. Our findings provide a plausible link between microvascular dysfunction documented during pregnancy and subsequent development of abnormal glucose metabolism years after pregnancy. We thank all the mothers who participated in this study, and all the clinic and research staff involved in running this study. The research data are available on request from the corresponding author. This study, entitled ‘Gestational Diabetes Mellitus and Risk of Postpartum Metabolic Syndrome’, is funded by the Singapore National Medical Council (NMRC/CNIG/1114/2013). L-JL is funded by a Singapore National Medical Council Transition Award (NMRC/TA/0027/2014). The GUSTO cohort, under the Translational Clinical Research (TCR) Flagship Program on Developmental Pathways to Metabolic Disease, is funded by the Singapore National Research Foundation (NRF) and administered by the Singapore National Medical Research Council (NMRC/TCR/004-NUS/2008). L-JL designed the study, conducted the whole study, performed data analyses and wrote the manuscript. KHT designed the study and reviewed and edited the manuscript. IMA interpreted the data and reviewed and edited the manuscript. YSC designed the study, reviewed the manuscript and provided research data. SMS designed the study, provided research data, reviewed the study proposal and reviewed the manuscript. PG designed the study, provided research data, reviewed the study proposal and reviewed the manuscript. JJW took part in data analyses, reviewed the manuscript and contributed to the discussion and editing of the manuscript. TYW designed the study and reviewed the manuscript. All authors gave their final approval of the version to be submitted for publication. L-JL is responsible for the integrity of the work as a whole.